Jack is back. The BFI have unveiled a brand new trailer for the upcoming UK re-release of the horror classic The Shining, directed by the one-and-only Stanley Kubrick. A full 144-minute digitally restored version of the film will be screening in a few UK cinemas around Halloween - you can find theater listings here. While I assume we've all seen this film and are quite familiar with most of it, it's always fun to watch a new trailer for a beloved classic film. Even Rodney Ascher, director of the Room 237 doc, commented on Twitter: "Impressive new trailer!" The Shining stars Jack Nicholson, Shelley Duvall, Danny Lloyd, Scatman Crothers, Barry Nelson, Philip Stone & Joe Turkel. Redrum. "Demands to be seen on the big screen." A family heads to an isolated hotel for the winter where an evil and spiritual presence influences the father into violence, while his psychic son sees horrific forebodings from the past and of the future. The Shining is the 10th feature film directed by legendary filmmaker Stanley Kubrick (made 12 years after he made 2001: A Space Odyssey), co-written by Kubrick & Diane Johnson. It's adapted from Stephen King's novel of the same name. 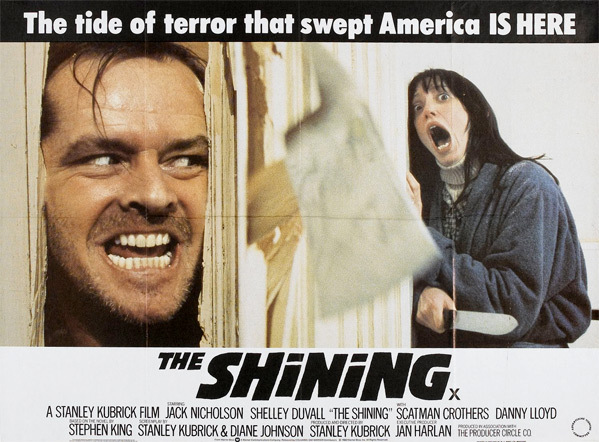 The Shining was first released May of 1980 in the US, before arriving in the UK in October that year. The BFI is re-releasing "a magnificent new digital transfer from Warner Bros" of the US version of The Shining in UK theaters, running 144 minutes in total, which is "24 minutes longer than the European version previously seen." For info, visit bfi.org.uk. No word on any US re-release yet. Grab the Blu-ray here. Ahhhhh, so good! God I love this film! A masterpiece, one of my all time favorites. I rewatched this recently and can confirm it still stands as one of the all-time greats in film. No matter the genre. I can't believe 2 of my fav horror films of all-time, The Shining & Blair Witch Project were nominated for razzies. Dude, f(*& that noise! Especially, the Shining? Masterpiece is an understatement. Weird. I just saw this in Sweden on an old 1980's 35mm print. Lovely, worn and magical. Would not want to watch in on a DCP. Without Jack Nicholson's amazing performance, shining would never have been shining. I don't know about that. He's incredible in it but you're telling me Hoffman wouldn't of nailed it out of the park? I'd say without that location/hotel, the Shining would never have been the Shining. Atmosphere is everything. Hoffman could (have) be(en) a serious contender indeed. But not in the same level of scariness as Nicholson. The movie is an classic, this trailer,...not so much. Masterpiece gets used all too often but this is truly a masterpiece in my book.